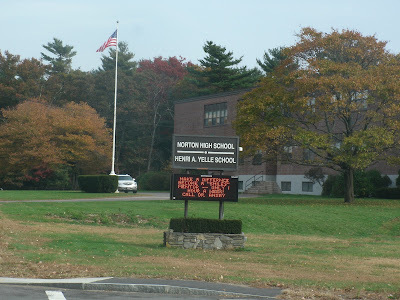 On a grey but warm late October day, Mrs. Hotdogman and I set out for Norton, Massachusetts and it was clear we weren’t going to drive by our destination! We were looking for Hot Dogs & More and we found it right across the street from Norton High School on route 123 in good old Norton, Massachusetts. 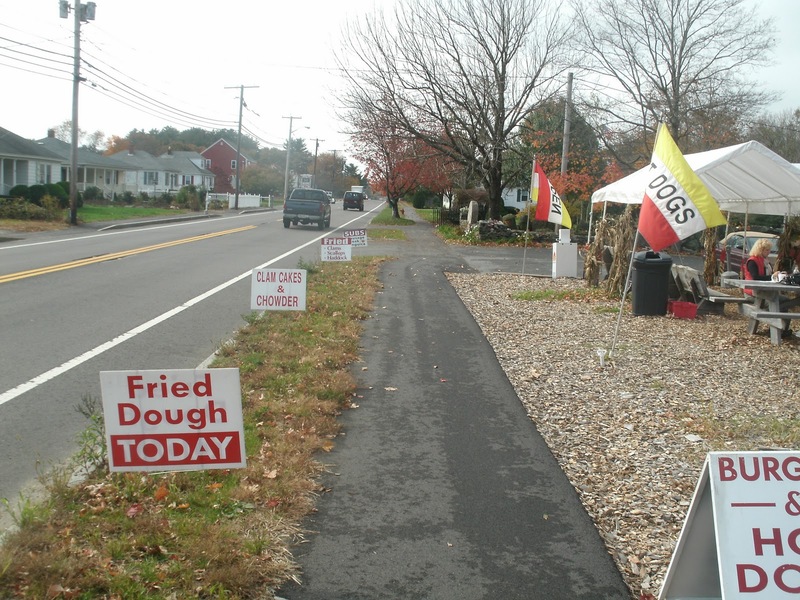 What an inviting little roadside hot dog stand! 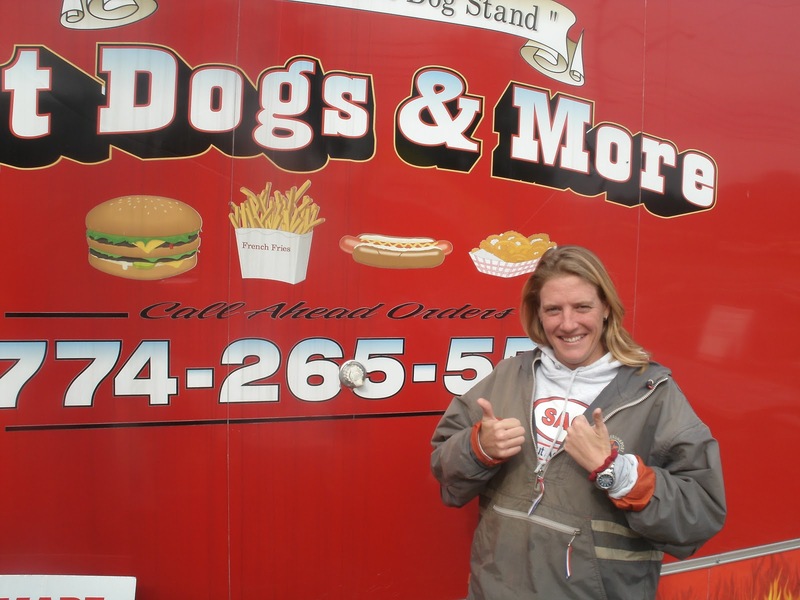 Hot Dogs and More was staffed by the fabulous Brenda. She was feeling shy today. 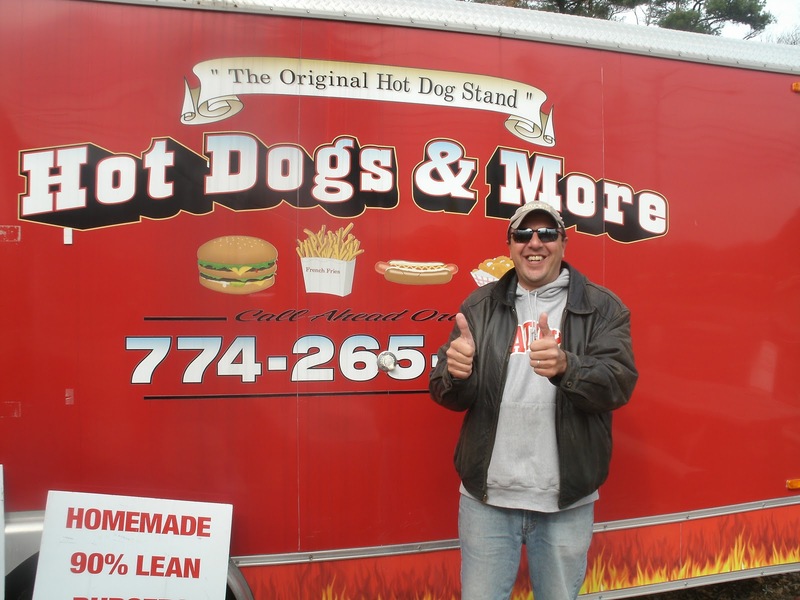 4 years ago, he had the Hot Dogs and More trailer custom built down in Florida. 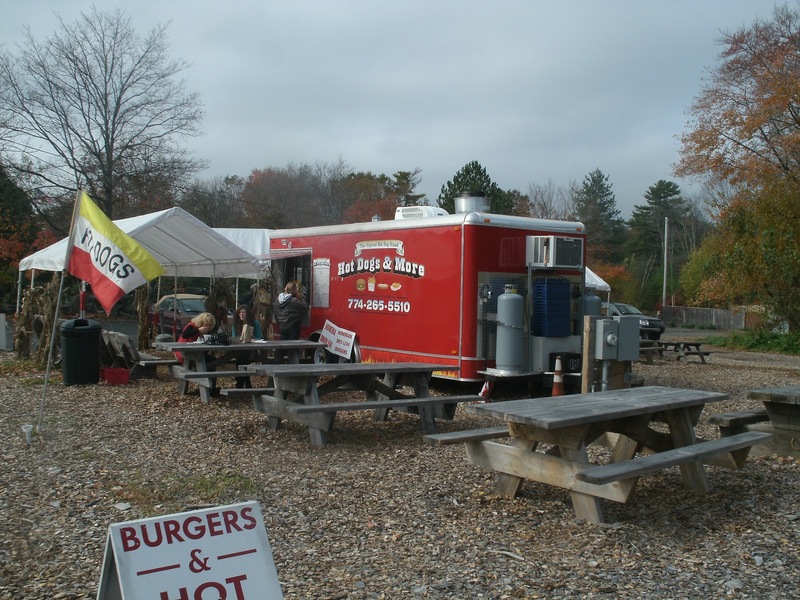 The trailer is located on family land, so location issues were minimal. 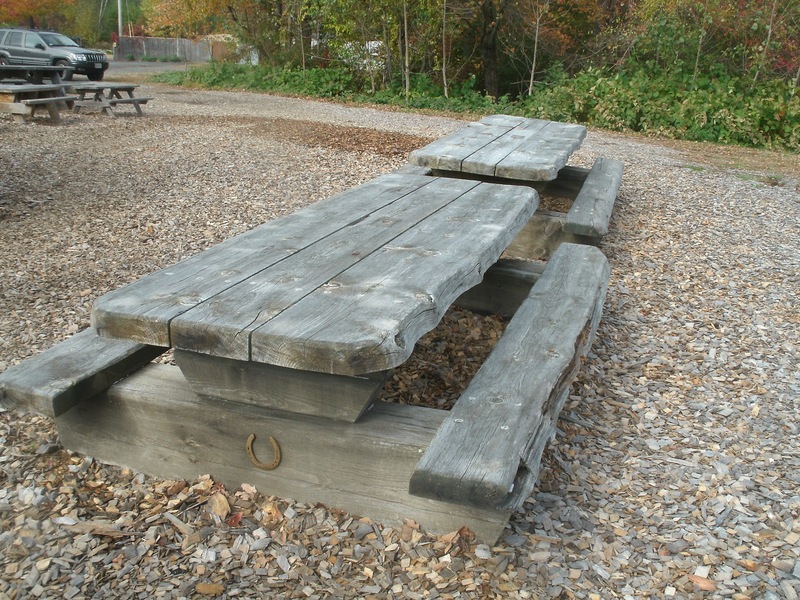 There’s plenty of parking and easy access too. Hot Dogs and More is open until Christmas and re-opens in February in time for Lent; there’s lots of seafood on their menu for Lenten feasting. Brenda told us to have a look around while she cooked up some lunch for other customers. There’s full electrical power to the trailer for the fridge, freezer, soft drink cooler and other electrical appliances plus two, large propane tanks to fire up the grill and fryers. 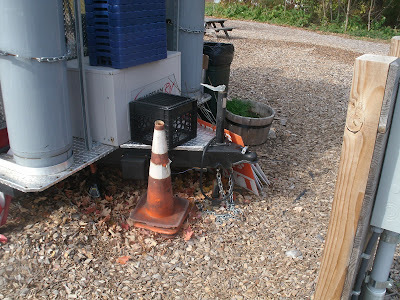 The employees even have their own entrance. 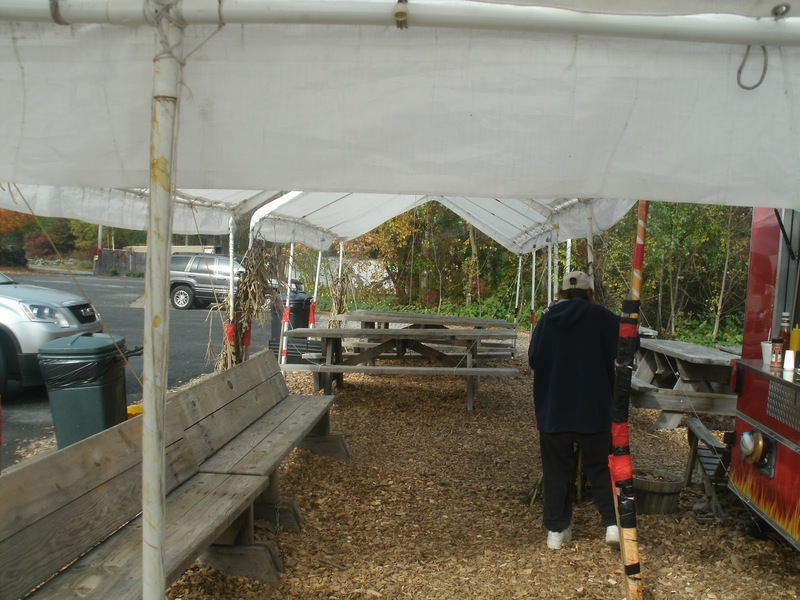 There’s lots of dining space; open air and covered. 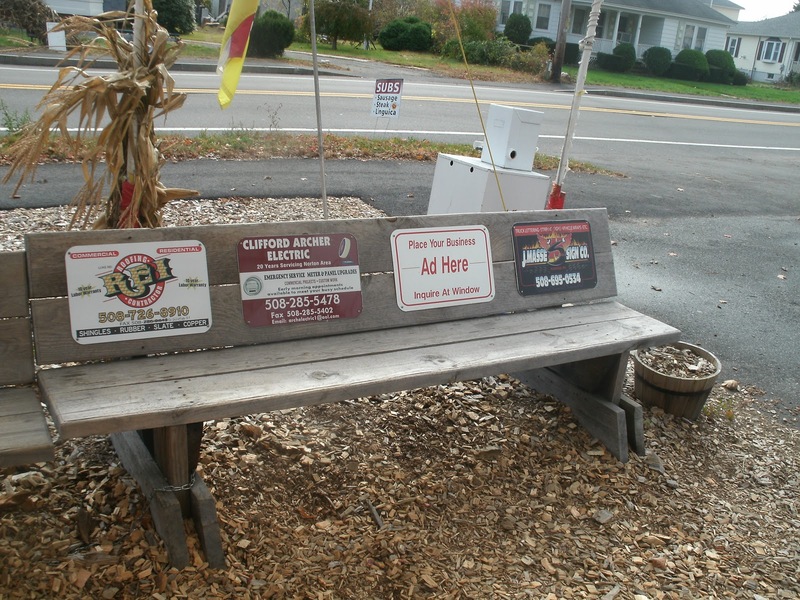 Jim doesn’t miss a trick-he’s selling ads on his benches! While the rig can be trailered…. we could tell it doesn’t move much. 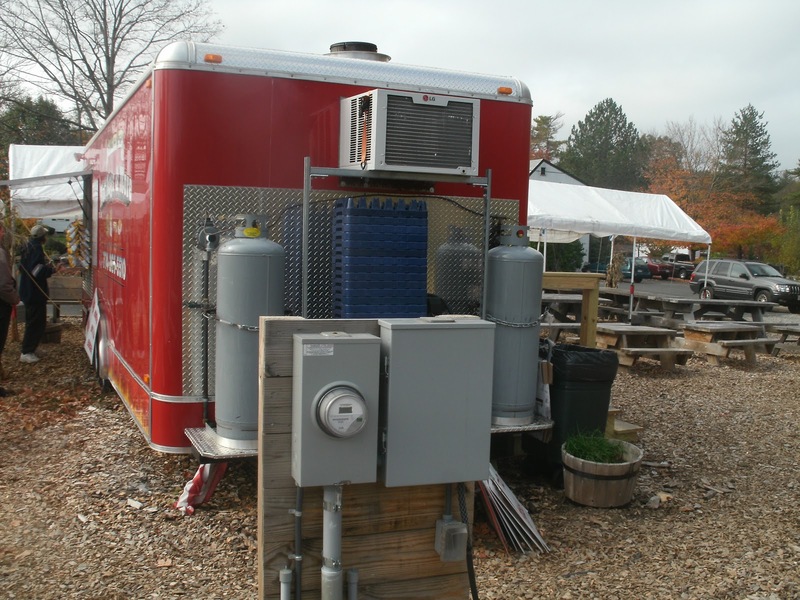 It’s a good thing too, it’s an 8′ x 24′ trailer- no small rig by any means! 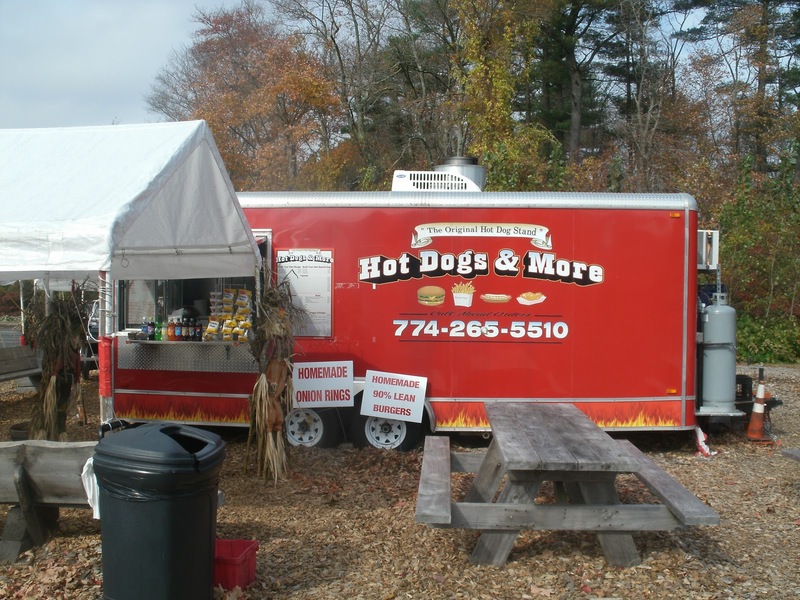 Brenda said they were bringing the trailer to Norton’s First Night Celebration. The Town of Norton turns 300 in 2011 and they’re kicking off the tricentennial year with a big New year’s Eve Party at Norton High. At least the Brown’s won’t have to take the trailer too far-the high school is right across the street. 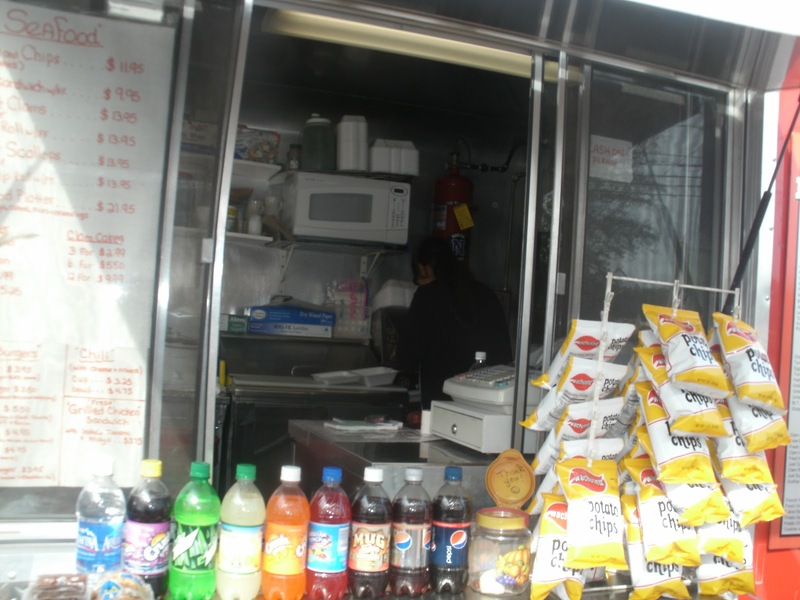 You put your order in here (that’s Brenda slaving over the hot dog steamer)…. 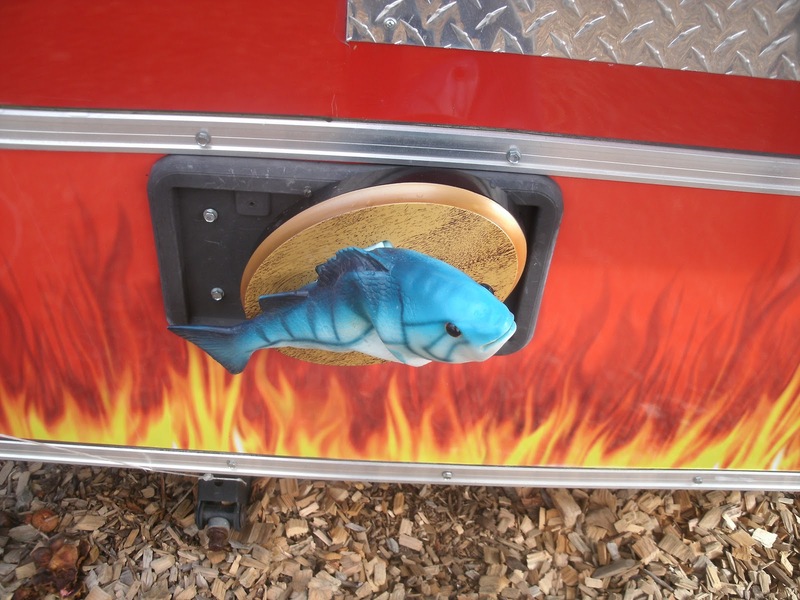 The little, singing “gimme back my filet-o-fish” fish can keep you company while you wait! 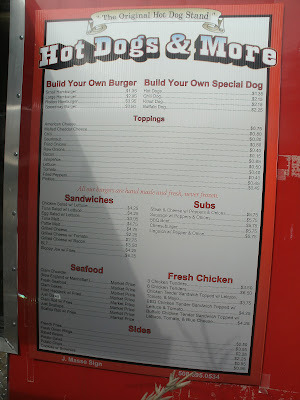 All this rummaging around the truck was making us hungry, so we took a look at the extensive menu. 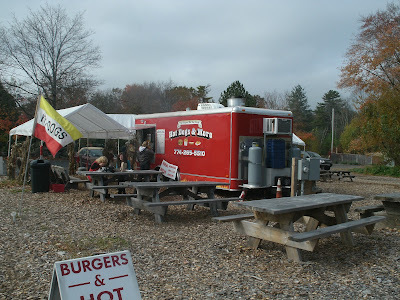 This is really like a diner in a trailer. 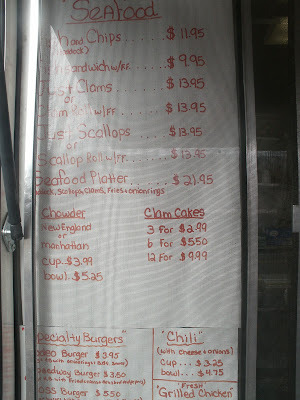 In addition to hot dogs, there’s burgers, subs, sandwiches, seafood, and chicken. 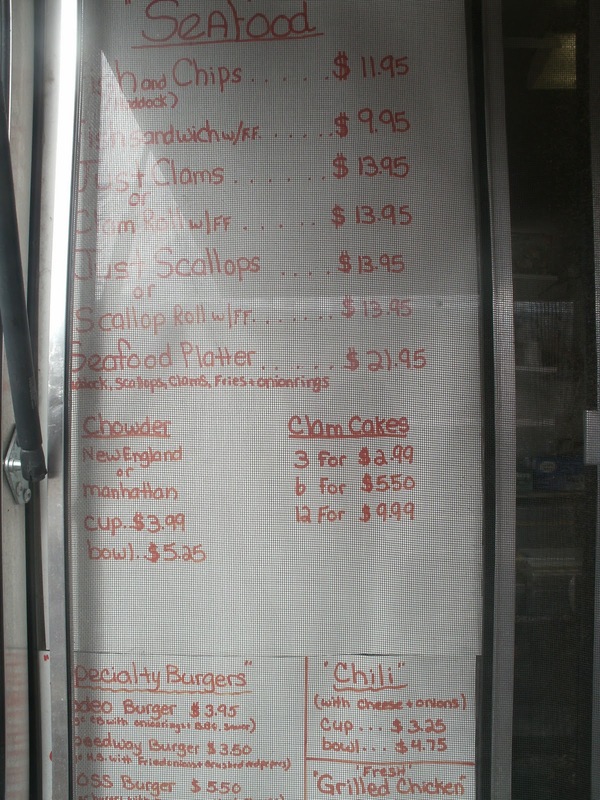 Here’s a look at the daily special board-lots of good looking seafood delights here. I love this kind of food. 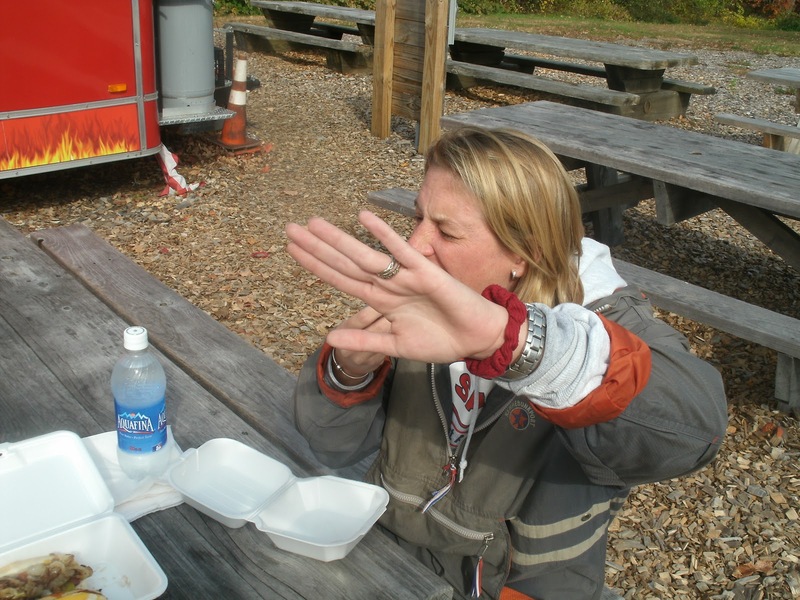 One of the downsides of doing this website is I can’t try everything! 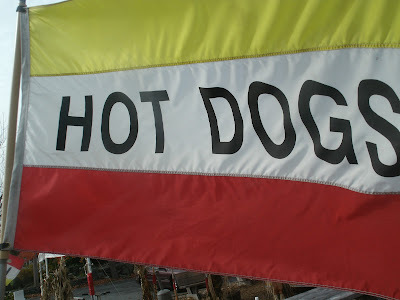 Of course, we were here for HOT DOGS. 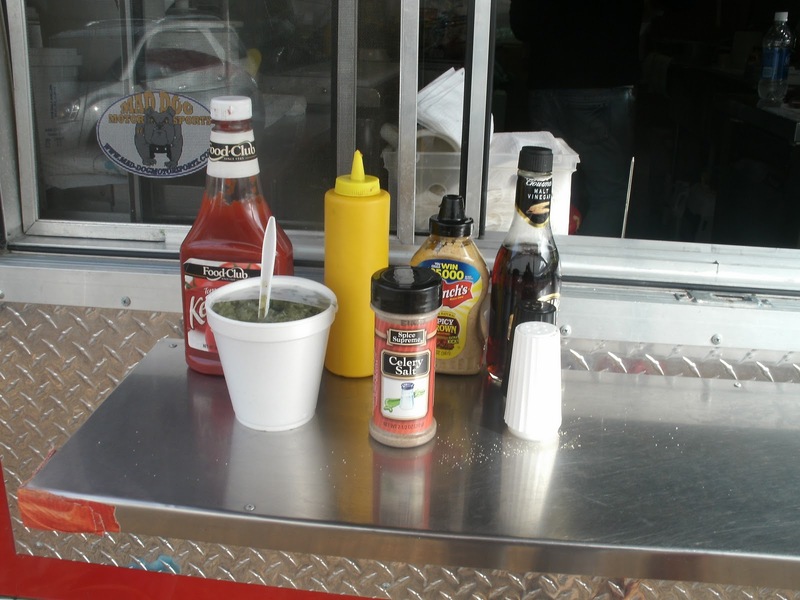 Hot Dogs and More serves up a Kayem skinless frank, steamed or grilled, on a steamed roll. 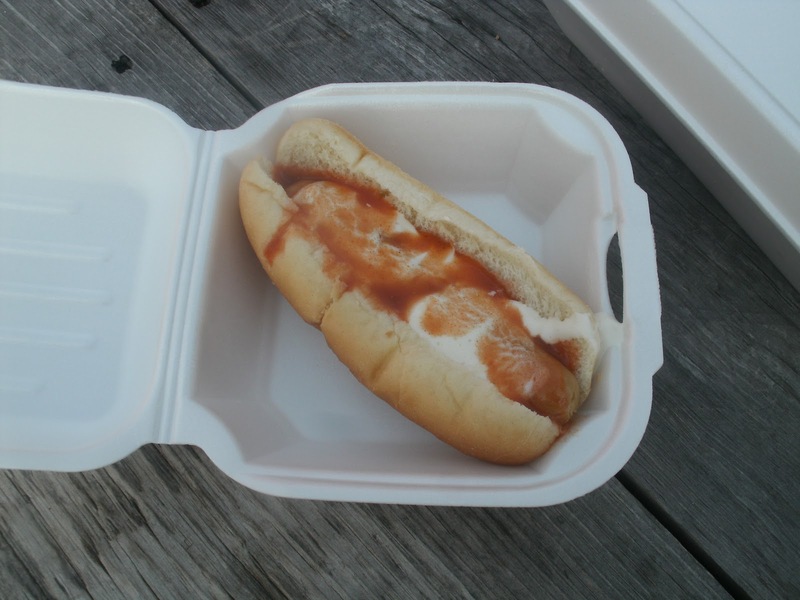 Mrs. Hotdogman went for a Buffalo Dog, topped with Buffalo Chicken Sauce and Bleu Cheese. 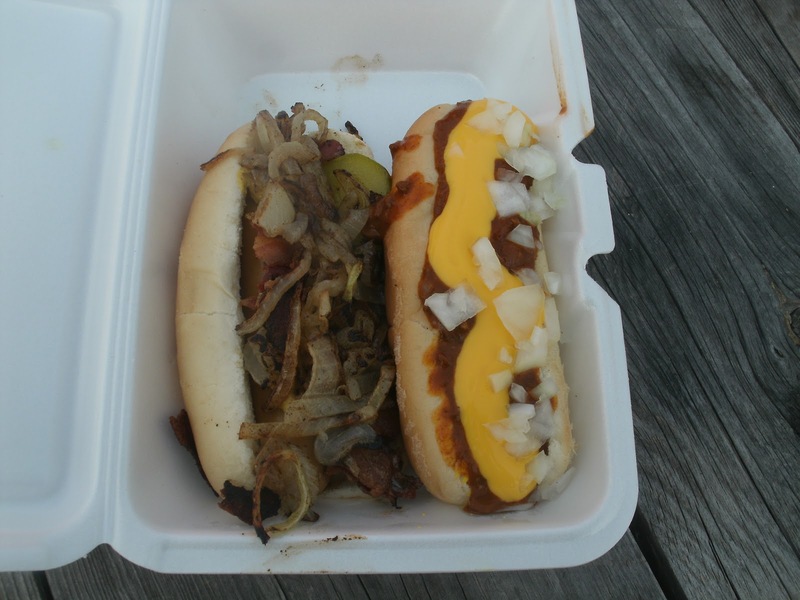 I went for a chili cheese dog with onions and mustard and I created my other dog myself: it has grilled onions, pickles, BACON (mmmmmm) and brown mustard. 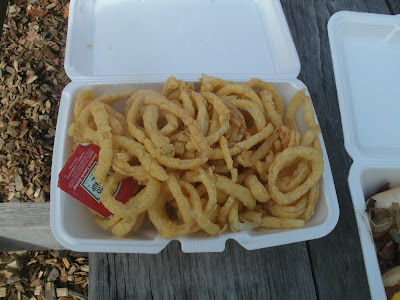 We also got an order of home made onion rings to share. My dogs were yummy. The chili was mild and plentiful. 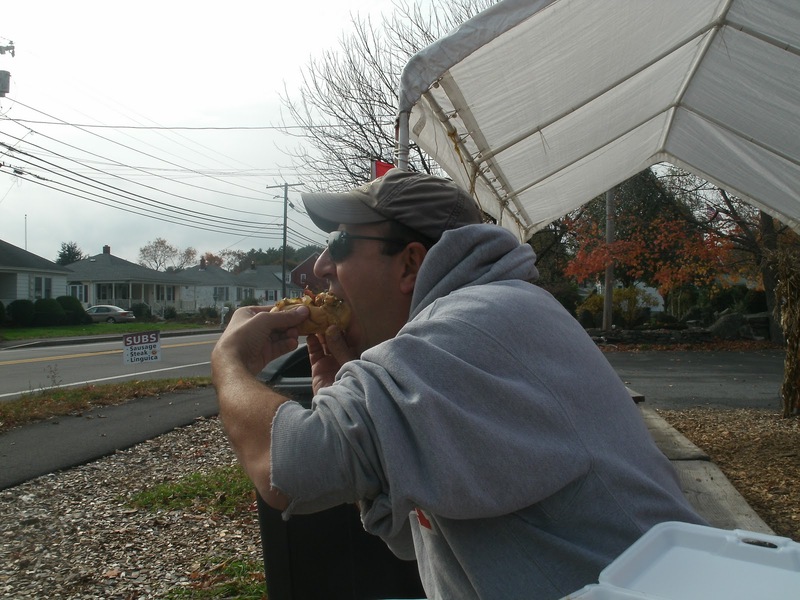 The real treat was my grilled onion, bacon and pickle dog. 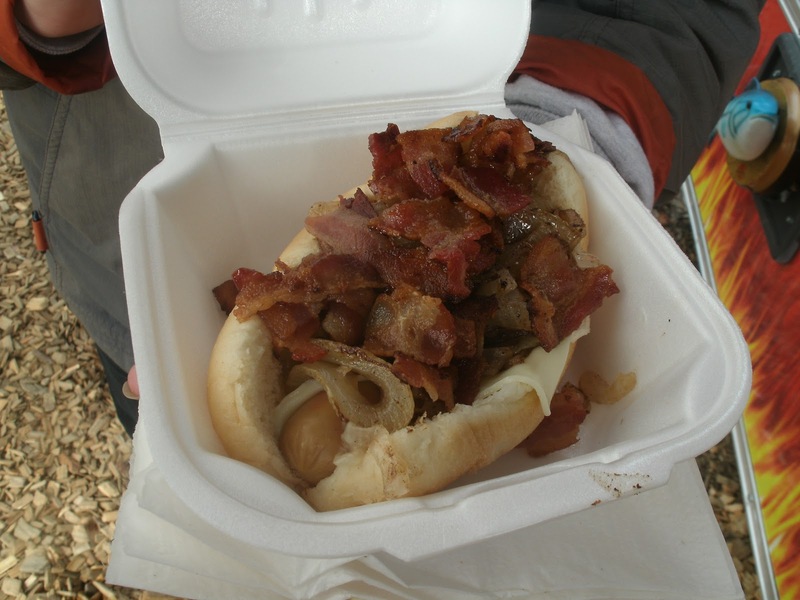 YOWZA this was a good dog. Mrs HDM liked her Buffalo Dog too. 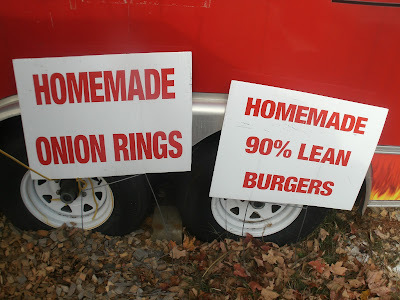 The biggest treat was the home made the onion rings. 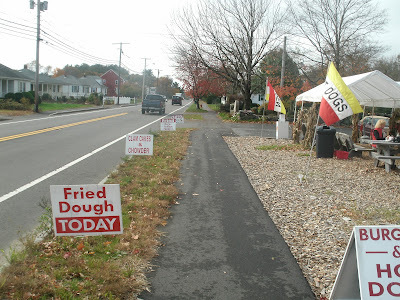 These were crispy, thin and light. They didn’t wilt or have the breading slide off either. Best onion rings we’ve had in a long time! 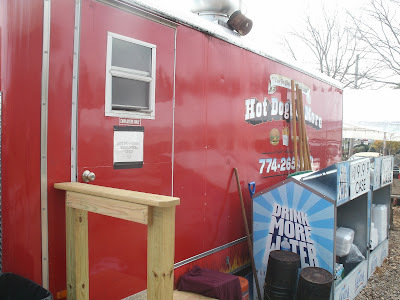 Mrs. Hotdogman was still hungry so she got a carbon copy of the dog I created. 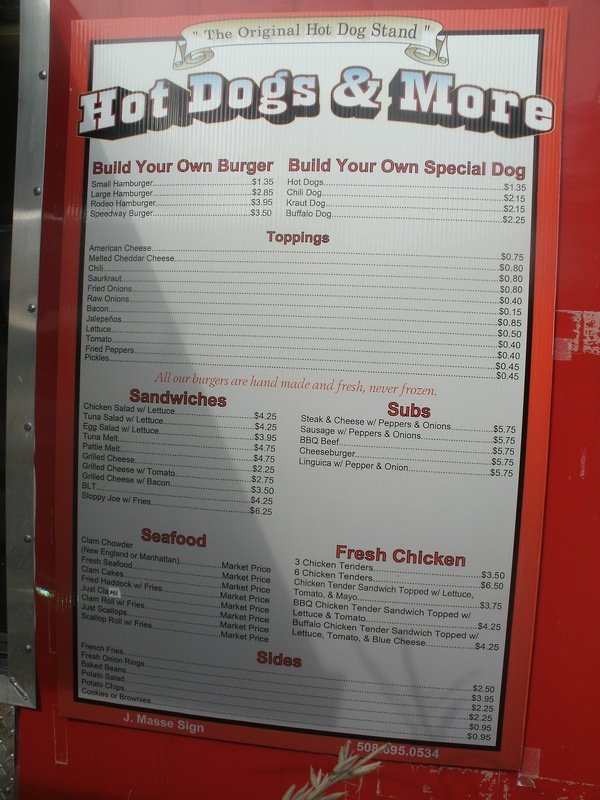 Makes ya hungry just looking at it, doesn’t it? and TWO THUMBS UP from moi.